We go through a lot of half-and-half at home between my sister and I. We each have a minimum of a morning cup of coffee every day during the week, and very often more whenever we can make it work, each with a little dollop of half-and-half because that’s the only way to drink it in my opinion. There are no boundaries on the weekend. In other words, we also go through a lot of coffee too. Recently, when I walked to the neighborhood grocery store to pick up a pint of half-and-half they were out of my brand, at least in the pint size. But they did have the quart, so why not? Well, we did a good job working our way through that container, but as 3 weeks were quickly approaching I decided something had to be done to use up what was left. After thinking for a bit, I decided on scones because, well, scones. :) If you’re in the same predicament as I was, give this recipe a try, they’re delish! I made this recipe twice. The first time I made a 1.5x batch to get a really nice sized scone. They turned out beautifully, but unfortunately they were too salty. Since they just have a little sugar in them, as scones should, the salt was overpowering. Still completely edible with a nice spoonful of homemade jam, but certainly not top notch. I made them again with half the salt and a smidge more sugar and enjoyed them much more. The original recipe also calls for 2 tablespoons of milk and 4 tablespoons of cream. I just replaced all of the liquid with the half-and-half and it worked great. Perfect way to use up that last little bit of the carton! Adjust oven rack to lower-middle position and preheat to 400°F (204°C). Sift flour into a medium bowl, then whisk in baking powder, sugar, and salt. Add butter and use a pastry blender, or two forks, to work the butter into the flour until it resembles a coarse meal. Add nuts and dried fruit and toss to combine, then stir in the 1/2 and 1/2 to form a soft (but not wet) dough. Turn dough out onto a lightly floured surface and pat into a 7-inch round. Cut into 6 or 8 wedges with a chef’s knife or a bench scraper. Sprinkle generously with coarse sugar, and arrange on a parchment-lined half sheet pan. Bake until puffed and golden, 25-30 minutes. Serve warm with clotted cream, jam, or a spoonful of whipped cream. Scones are best eaten the day they are made. They do freeze well however if you have leftovers. When ready to eat, thaw to room temperatures. Reheat in a preheated 425 degree oven for 4-6 minutes until heated through and crisp, but before they start to bake through again and dry out. So, I know I posted a pumpkin scone recipe just a few weeks ago, but I couldn't resist posting another one. Since it's almost the end of November (which I consider the unofficial pumpkin-baked-good month) I had to share this recipe before the month is over. I've made quite a few different pumpkin scone recipes in the past which have all been good, but when I made this one last week I knew I had the winner! I think this is probably the best one of the bunch. It's a classic scone, buttery and tender, with the addition of a little pumpkin and scented with warming autumn spices. I was planning on adding some chocolate or nuts to the dough, but I realized when they were all cut and on the baking sheet that I had forgotten to add anything at all. But I needn't have feared, they turned out amazingly! Everything I wish for in a scone. Whether you keep theses scones plain, or add your favorite mix-ins, you won't be disappointed, I promise! Yum!! So tender and delicious! These scones did not turn out tough like some pumpkin scones do. I think it's key to work the butter evenly into the dough, not leaving the pieces too big so the butter just melts out. And also be very careful not to add too much liquid. I've made this mistake in the past and it leads to a tough finished product. You want just enough of the liquid to pull it all together, and not any more. I usually don't add all the liquid right away at the beginning, instead adding it a little bit at a time until all the dough is moistened and just sticks together. Stop at this point and start shaping. This will help that end product be a real winner! Some chocolate, walnuts, pecans, or cranberries would all be fabulous. Or just keep them plain and simple, and enjoy those warm and buttery spices. Line a sheet pan with parchment paper. Cut the cold butter into 1/4" cubes and place in the freezer while prepping the other ingredients. Sift the flour, corn starch, brown sugar, spices, baking powder, baking soda, and salt into a large mixing bowl. Add the cold butter to the sifted ingredients. Use a pastry cutter to cut in the butter into the pastry until evenly incorporated. The butter should be small, about pea sized, evenly coated, and distributed in the flour. In a separate bowl, mix 2 tablespoons of the half and half, pumpkin puree and vanilla and pour into the flour mixture. Gently stir the mixture until the flour is just moistened. The dough will be shaggy and seem dry. Add more half and half very slowly as needed for the dough to just hold together. Do not add too much liquid or the scones will turn out flat and tough, you want to add just enough so that the dough barely holds together. Dump the contents out of the bowl onto a flour dusted work surface and shape into a circle approximately 3/4-1 inch thick, depending on your preference. Cut the circle into 4-6 wedges. Place scones on the parchment lined sheet pan, cover and place in the fridge for 20 minutes. (At this point, the scones can be held in the fridge overnight for a quick bake in the morning. Just make sure they are wrapped tightly). Preheat oven to 425F while the scones are resting in the fridge. Before baking, sprinkle the coarse sugar evenly over the top of each scone if desired, using a little water to help it stick if needed. Bake for 18-20 minutes or until golden. Enjoy warm or at room temperature. This past week I took my first vacation days of residency. It has been absolutely wonderful. 5 days off (plus both weekends - bonus!) to do absolutely nothing. I really had nothing planned (other than a dentist appointment, woohoo) which is really how I like my days off to be, relaxing and uneventful. It's been kind of a gloomy week. Rainy and cold for several days, not a lot of sun. Early in the week I decided that I needed to had something fun to enjoy for breakfast while on vacation. Since it's October I really didn't have any other choice than to make something pumpkin-y! Something seasonal to leisurely enjoy with my morning cup of coffee. After much deliberation I settle on scones. Scones are one of my favorites! I made some delicious pumpkin scone with cranberries and pecans last year, but I had a couple other recipes pinned so I figured I'd try a new one! This recipe is from Joy the Baker, one of my favorite bloggers, and probably the blog I've been following the longest of any food blog. I trust her recipes so I knew this would be a winning recipe. They were the perfect treat for my chilly fall morning breakfasts! Scones are not difficult. These are pretty basic as scones go, similar to the ones I made last year. These did spread a little while baking, but not too much. They are moist and hearty. Pumpkin scones never have that crispy airiness that traditional scones have, but that's to be expected due to the moist and dense pumpkin. Add a little drizzle of glaze for looks and extra sweetness and then dig in. Don't forget the coffee! Place rack in the upper third of the oven and preheat oven to 400 degrees F. Line a baking sheet with parchment paper and set aside. In a medium bowl, whisk together flour, brown sugar, baking powder, baking soda, salt, and all of the spices. Add the cold butter to the dry ingredients and toss to coat. Using your fingers or a pastry cutter, break the butter down into the dry ingredients. Work quickly so that the butter remains cold. Some of the butter will be the size of oat flakes, others will be the size of small peas. In a small bowl, whisk together buttermilk, pumpkin puree, and vanilla extract. Add the wet ingredients, all at once to the dry ingredients. Stir together until almost thoroughly combined. Add walnuts and cherries and stir until no dry flour bits remain. Turn the dough out onto a lightly floured counter. Shape into a small circle, approximately 1 1/2 inches tall. Use a bench scraper or a sharp knife to cut the circle into 6 or 8 wedges. Transfer scones to prepared baking sheet. Leave about 2-inches of space between each scone. Bake for 18 to 22 minutes or until browned slightly with dry tops. You can insert a toothpick into the center of a scone to test for doneness. Earlier last month I went on my last trip before residency started. The last hurrah to normal life for a while. Lara and I took a quick trip to Chicago to visit our cousin who lives in Bucktown. We had been talking for a while about us visiting Chicago to see her and her place, and explore her neighborhood. We finally got it done just in the nick of time. We only went for a short weekend, but we had a marvelous time while there. Did a lot of walking, exploring, shopping and of course, eating! I had my first real ramen eating experience which was awesome, visited a great local coffee shop, and perhaps most importantly, grabbed a quick breakfast at a nearby bakery before church on Sunday morning. Since Lara and I are earlier risers than most, we got up before anyone else on Sunday and decided to grab some coffee and pastries while everyone else in the house slept. Just a couple miles down the road was Floriole Bakery. I'd been here the last time I visited Chicago and loved it, knew it was a place I would go back to. I was right, it was just as wonderful on this visit. It was very difficult to decide what to get, everything looks amazing, but I ended up ordering a delicious cup of coffee and a buckwheat scone which sounded interesting to me. It was the perfect choice. I absolutely loved the scone. The combination of the buckwheat combined with a little cardamom and some citrus notes was just perfect. A little sandy and course in texture, but not too crumbly. I instantly wanted to recreate this at home. When I got back to Michigan I did a little online searching and wouldn't you know it, I found a recipe for buckwheat scones from Floriole Bakery on the Chicago Tribune's website. Perfect!! I quickly ran to the store for some buckwheat and whipped a batch of these beauties together. The verdict? The flavor is spot on, but the texture is slightly different, not as sandy. Their scones almost seemed like they had cornmeal in them, giving them a coarser texture which my scones did not have. When I look on the bakery's website online they describe the buckwheat scones as flourless while this recipe calls for 1/3 cup of flour. So there are definitely some differences, not surprising, but in the end it's not a big deal. This recipe is definitely similar to the original and most certainly a keeper! It is unique, easy to make and delicious. I will definitely make these over and over again! I made a few changes to the recipe as it was printed online. I replaced the orange zest with lemon zest because I didn't have any oranges. I was bummed about this because I love adding orange to baked goods, but they still turned out great. I also didn't use cream as stated, but instead used a mix of whole milk and liquid whey (2 ounces whole milk, 1 ounce whey) to make my own "buttermilk" and it worked just fine. I did only needed to use 6 tablespoons of liquid though, as opposed to the 1/2 cup of cream called for. So be careful when added the liquid, start with less than 1/2 cup because you may not need it all. Because there is not a lot of gluten in these scones (buckwheat is actually not wheat and is therefore gluten free) they are a little more delicate than traditional scones, but they aren't so delicate as to fall apart with a glance. As with the original scones, this recipe calls for you to make a thumbprint in the scones before baking and fill this with raspberry jam. I didn't have raspberry jam, or any other jam, so I skipped it this time and they were just fine without it. But for a little extra oomph of flavor I would definitely add this in on another go around. So if you're looking for something a little different for breakfast, or have been wanted to play around with some buckwheat flour, give these scones a go, you won't be disappointed! Measure 6 tablespoons of the oats (30 grams) and the sugar into the food processor. Buzz, reducing oats to flour. Transfer oat/sugar mixture to a large bowl. Add the buckwheat flour, all-purpose flour, lemon zest, baking powder, baking soda, cinnamon, cardamom, and salt. Stir to combine. Add the butter. Using a pastry blender, cut in butter, stopping when the largest butter bits are about the size of peas. Mix in remaining 6 tablespoons rolled oats. Drizzle in the buttermilk slowly. The dough will come together in large clumps that stick together readily when pressed. You may not need to add all the liquid. Add only as much buttermilk as needed for the dough to hold together. Shape the dough into 10 equal sized balls and set on a baking sheet that has been lined with parchment paper. Sprinkle with a little coarse sugar if desired. Slide baking sheet into a 350-degree oven and bake until just set, 18-20 minutes. Eat warm, or at room temperature. I've been aware for some time now that there are quite a few different edible flowers out there; nasturtium, squash blossoms, chive blossoms, lavender, even marigolds and pansies to name just a few. Up until this point however, other than playing around with some lavender (lavender shortbread cookies!) I really haven't done much with these flowers. I decided to change that this spring when I saw the lilac bushes start bursting with their beautiful flowers, perfuming the air when I take walks. It is one of the best smells imaginable. It was a video I saw earlier this spring from Kitchen Vignettes that first peaked my interest in playing around with some lilacs. Then my sister showed me this recipe for lilac blossom scones from Holly and Flora and I knew I had to make them. I did a little urban foraging one morning, coming back home with a bag full of lilac blossoms. Into the scones they went, and I also made a quick lilac blossom simple syrup that I've been using to make vanilla and lilac tea lattes (yum!) all week. So although the lilacs blossoms will soon disappear for another year I will thankfully have the memory of these buttery and delicious scones to hold me through until next spring. The flavor of lilac blossoms is quite mild, so don't be afraid that these scones will taste like perfume or potpourri. 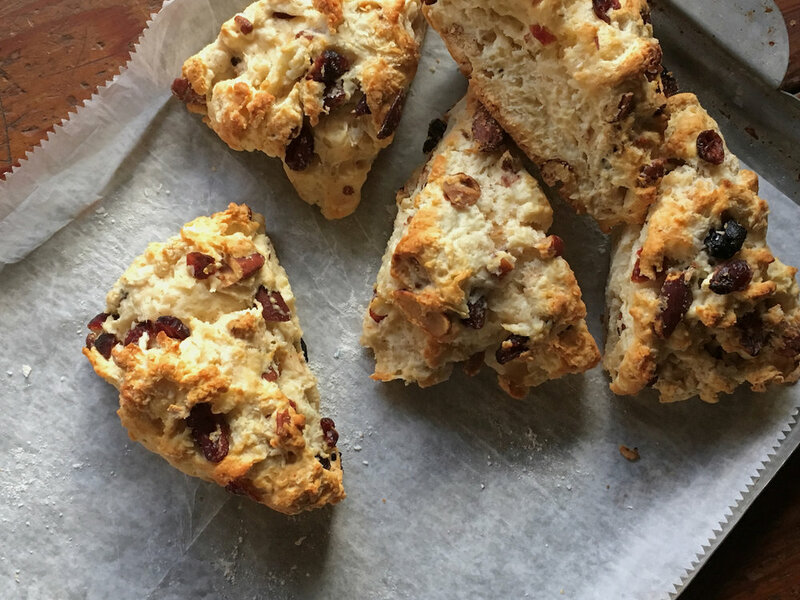 They lend a quiet floral flavor and aroma to the scones without being overpowering. The almonds add a nice crunch and obvious nuttiness that pairs well with the blossoms. I think the addition of a little bit of white chocolate would be a wonderful third component, but I didn't have any on hand at the time so I wasn't able to try it out. Next time! Some people might be a little intimidated by scones if they've never made them before, but they really are so easy to make. A few things I like to keep in mind: make sure your butter is very cold before starting, don't over-mix the dough once you add the liquid, and don't add too much liquid or your dough will be too soft and the scones may be a little tough. I usually don't add all the liquid right away, just to make sure I don't add too much. You can always add more as needed. You only want as much liquid as necessary to just hold everything together, and not any more. This is a fairly basic buttermilk scone recipe, with the addition of lilac blossoms and almonds. Wonderfully simple and delicious. I made my scones on the smaller side, halving the original recipe and cutting them half as big as what was originally called for, but if you want bigger, more coffee-shop sized scones, make 4 scones out of the recipe below (or double it and make 8 as in the original recipe). Pre-heat the oven to 425 degrees. In a large mixing bowl, combine the flour, sugar, baking powder, baking soda, and salt. Whisk the ingredients together. Cut the chilled butter into small cubes and toss into the dry mixture. Using a pastry blender or your fingers, work the butter into the flour mixture, until pea-sized lumps of butter are present. Bake 12 to 16 minutes, rotating the baking sheet halfway through, until turning golden brown on the edges. Serve warm, plain, or with a little butter and your favorite jam. Scones are one of my absolute favorite breakfast treats, but they are one of those things I just don't seem to get around to making very often. I'm not really sure why, they are so easy to throw together. Truly, they come together in just minutes, and usually with just a few ingredients. So last week I finally managed to get my act together and whip up a batch of scones, and since it's November I decided on pumpkin scones with some cranberries and pecans. They came together in a jiffy and baked up beautifully. A perfectly delicious fall breakfast. Whenever I make scones I make sure that I have time to freeze the cut, unbaked scones for at least an hour or two, preferably overnight. I've found that this ensures the tallest, prettiest scones. To me a scone should rise nice and tall, I really do hate it when scones spread out and flat. But that's just my opinion, I'm sure some people out there like a flatter scone, to each their own. Like I said, I filled these scones with dried cranberries and pecans but you can change that up if you'd like. Some dark chocolate would be wonderful, pumpkin seeds would be very fitting, or some other nut, walnuts or almonds maybe. Whatever you decide on you shouldn't be disappointed with this tasty fall treat. Grab a cup of coffee or tea and enjoy! Work in the butter with a pastry blender or two forks just until the mixture is unevenly crumbly; it's okay for some larger chunks of butter to remain unincorporated. Stir in the cranberries and pecans. In a separate mixing bowl, whisk together the pumpkin and egg till smooth. Add the pumpkin/egg to the dry ingredients and stir until all is moistened and holds together, trying not to overwork the dough. Scrape the dough onto a lightly floured counter and shape into a 5-6" circle approximately 3/4" thick. Slice the circle into 6 wedges and arrange the wedges on a parchment lined sheet pan. Brush each scone with milk, and sprinkle with coarse white sparkling sugar or cinnamon sugar if desired. Bake the scones for 20 to 24 minutes, or until they're golden brown and a toothpick inserted into the center of one comes out clean, with no wet crumbs. This semester my sister Lara and I started a new weekly tradition. Once a week, usually Wednesday or Thursday mornings, we head over to our favorite local bakery, Wealthy Street Bakery, where we split a pastry and enjoy a cup of super dark coffee with plenty of half and half. It has probably become my favorite time of the week! Each week it can be difficult to decide what to get to eat, the options are all so good. There are muffins, scones, croissants danishes, cinnamon rolls, breakfast cookies, babka and bread pudding to name just a few! There is absolutely no way I can name a favorite breakfast treat, but I do have to say that I absolutely love the flavor and texture of their scones. They are so light and soft, yet slightly crisp, light but not overly delicate. In the last few months I have been on the search for a scone recipe that may somewhat compare to these little beauties. Here is one attempt at this difficult and important challenge. I decided to start by trying Martha Stewart's scones from her Baking Handbook, which is a wonderful cookbook and has never let me down. This was no exception. These scones turned out delicious, with a great texture and were beautiful too. I have been enjoying them all week with a smile on my face. With that said, these scones were not exactly like the scones from Wealthy Street. They are not quite as tender, and just a little too crunchy. Instead of being lightly crisp on the outside, they are slightly firmer, not quite as light. I fixed this a little by turning the temperature of the oven down partway through baking which worked very well, but they were still a little harder than I want. Still delicious of course, but not the texture I am looking for. However, the flavor is excellent and the scone overall is fantastic. Definitely something I can make again (after I find the copycat recipe I want so badly!). Give these scones a try, they really will make your breakfast extra special. Make a well in the center of the dry ingredients. Pour the cream into the flour mixture. Slowly draw the dry ingredients over the cream, gradually gathering and combining the dough until just coming together. If it is too dry, add more cream, 1 tablespoon at a time. Preheat the oven to 375 degrees. In a small bowl, lightly beat egg yolk with a couple tablespoons of cream or milk; brush over the tops of the scones and sprinkle generously with sanding sugar, if using. Bake for 15 minutes. Rotate the baking sheet, reduce the heat to 325 degrees and continue baking for 15 to 20 more minutes. Transfer to a wire rack to cool. Serve warm, or at room temperature.